Do you have a business that requires you to use one or more cash registers? If you answered yes, you might not be all that happy with the cash register software that you’re using now but haven’t been shopping around for a new one because you thought they were all the same – Sound familiar? Well they’re definitely not all the same - Abacre Cash Register is in a league of its own. It contains exceptionally reliable and secure authorization levels, can run on multiple computers at one time with no issues, and so much more. If you need a software that’s going to act as a cash register for any reason at all, Abacre Cash Register is one of the best solutions. - Works with all commonly used hardware (touchscreens, POS printers, barcode readers, etc.). 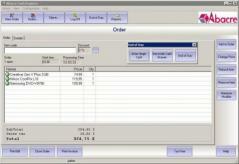 - Allows you to customize the layout of your client bills to suit your individual needs. - Can be set up to be used with any currency at all. - Supports various taxes and number formats. - Allows you to accept payments via cash, credit and debit cards, and/or cheques. - Quickly and easily generates sale reports that are easy to analyze and understand. - Can greatly improve your business’s turnover and profit margins. - Incredibly easy to use for managers and employees alike. Please note that this trial version of the Abacre Cash Register will only remain valid for 30 days, and that during that time you will be nagged to download the full version of the program to your Windows system.